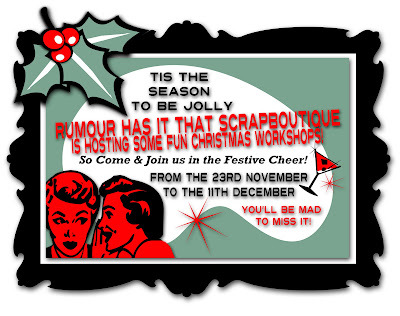 Thought I had better let you know that Scrapboutique started its Christmas Workshops on Tuesday and this Friday is the first of my workshops. Here's a little sneak peek at what I have planned. Its a Tri-Shutter Card and Snow Globe Bauble. If you do want to join me Friday night here is the list of materials you'll need to start making some festive cheer. We also have our last CC for the year starting friday night, its a 'Right Royal' Night, so think lots of bling, velvet and regal colours! Hopefully I'll see you at the forum! Hmmm...have to see if I can fit it in! !